The warmth of a family inn…the value of a hotel. 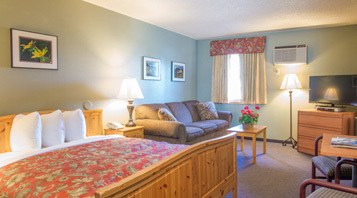 The Old Town Inn makes a great home base for your Crested Butte adventures, wild or civilized. Conveniently located in historic Crested Butte (park your car and leave it there! ), the inn offers hotel amenities with the personal feel of a bed-and- breakfast. Our guests enjoy many extra touches: from a beautiful Continental breakfast to fresh-baked afternoon cookies. Cruise town on a guest bicycle; borrow a sled or snowshoes; soak in our outdoor hot tub; or browse our bookshelves while sipping a cup of organic, locally roasted coffee. We take great care of our guests – and we take care of our mountain home with advanced green initiatives. Come play and relax with us! 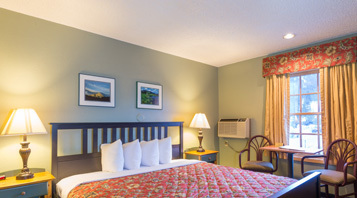 The Old Town Inn has 33 spacious and spotless rooms. Most have two queen-sized beds. We also offer king rooms, pet-friendly rooms, and a suite if you prefer. 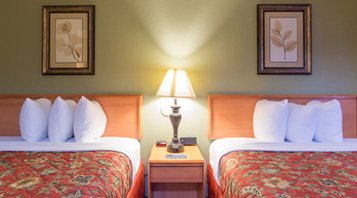 Along with many other amenities, all rooms feature HD cable with HBO, free wireless Internet and daily housekeeping. Click Queen Room for pet-friendly options. "Oh my goodness. From the beautiful flowers outside and inside, to the excellent breakfast, hiking advice, free bikes, and great beds, this place was perfect for our first Crested Butte vacation." "This hotel staff makes you feel like friends right from the start." " Great location, just a couple of blocks' walk to the main part of town. I'll definitely stay here again." "Great price, comfortable rooms, and the best free continental breakfast we've ever had at a small town motel. Coffee and tea and fresh made cookies available too. So glad we found this place!" Our employees take great care of our guests – because that’s the kind of people they are. Knowledgeable, kind, helpful. Just read our online reviews! It’s all right here. Walk or bike to downtown shops, galleries and restaurants, Nordic skiing, hiking/biking trailheads, and the Center for the Arts. Ride the free town shuttle to the ski slopes. We walk the talk. A TripAdvisor GreenLeader, the Old Town Inn uses 100% green-powered electricity, composting, eco-friendly breakfast ware and cleaning products, and comprehensive recycling. You can feel the difference. Our family has deep roots in Crested Butte, and we want to share our love for it. In shaping the Old Town Inn, we rely not on corporate edicts, but on genuine caring.